Saint Hugh the Great, Abbot of Cluny, born at Semur (Brionnais in the Diocese of Autun), 1024; died at Cluny, 28 April, 1109. The eldest son of Count Dalmatius of Semur and Aremberge (Aremburgis) of Vergy, Hugh was descended from the noblest families in Burgundy. Dalmatius, devoted to war and the chase, desired that Hugh should adopt the knightly calling and succeed to the ancestral estates; his mother, however, influenced it is said by a vision vouchsafed to a priest whom she consulted, wished her son to dedicate himself to the service of God. From his earliest years Hugh gave indication of such extraordinary earnestness and piety that his father, recognizing his evident aversion from the so-called gentle pursuits, entrusted him to his grand-uncle Hugh, Bishop of Auxerre, for preparation for the priesthood. Under the protection of this relative, Hugh received his early education at the monastery school attached to the Priory of St. Marcellus. 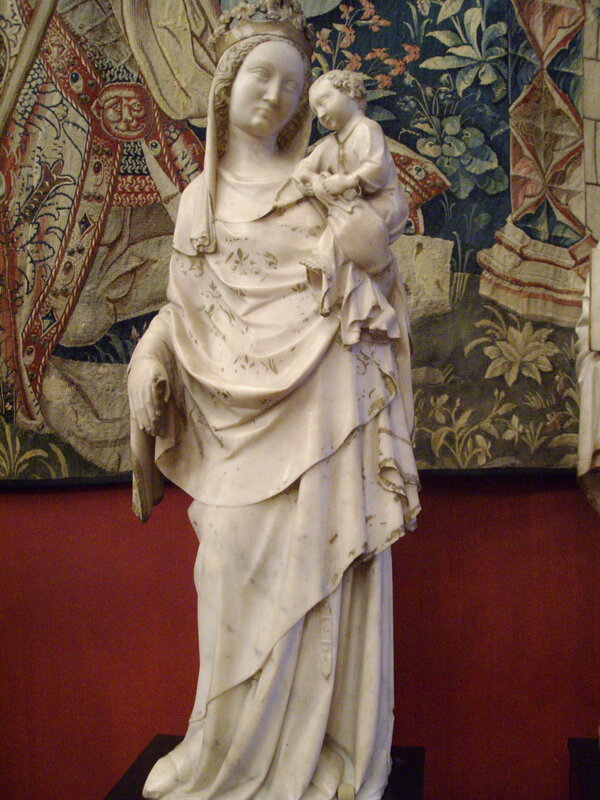 Statue of the Blessed Virgin Mary with the Christ Child, from the Abbey of Cluny. Photo by Harmonia Armand. 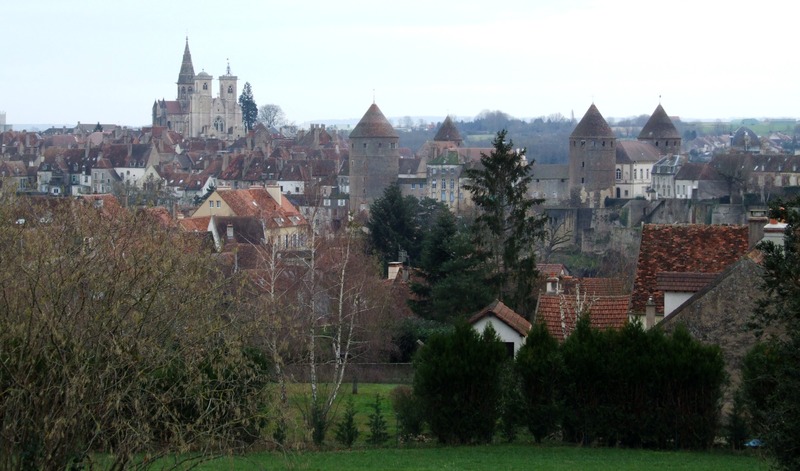 At the age of fourteen he entered the novitiate at Cluny, where he displayed such religious fervor that he was allowed to make his vows in the following year without completing the severe novitiate usual at this monastery. The special privilege of the Cluniac Congregation enabled him to become deacon at eighteen and priest at twenty. In recognition of his wonderful zeal for the discipline of the order, and of the confidence awakened by his conspicuous talent for government, he was quickly, in spite of his youth, chosen grand prior. In this capacity he was charged with the whole domestic direction of the cloister in both spiritual and temporal affairs, and represented the abbot during his absence (Cfr. D’Achery, “Spicilegium”, 2nd ed., I, 686). On the death of St. Odilo on 1 January, 1049, after a prolonged administration of nigh on half a century, Hugh was unanimously elected abbot, and was solemnly installed by Archbishop Hugh of Besançon on the Feast of the Chair of Peter at Antioch (22 February), 1049. Hugh’s character bears many points of resemblance to that of his great contemporary and friend, St. Gregory VII. Both were animated with a burning zeal to extirpate the abuses then prevalent among the clergy, to crush investiture with its corollaries, simony and clerical incontinence, and to rescue Christian society from the confusion into which the reckless ambition and avarice of rulers and the consequent political instability had thrown it. The emperor claimed the right to appoint bishops, abbot, even the Pope himself, and in too many cases his selection was swayed entirely by political motives to the exclusion of every thought of religious fitness. 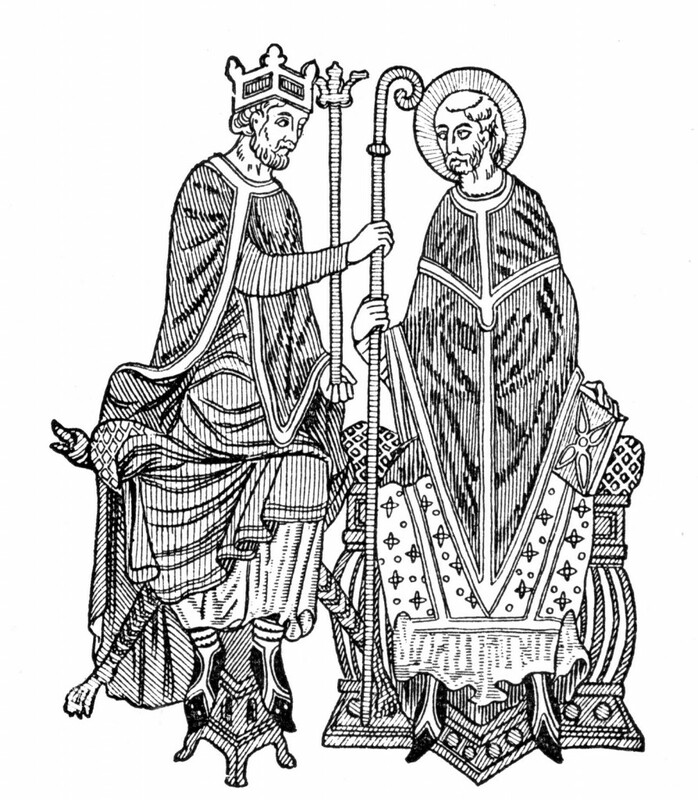 To prevent the Church from lapsing into a mere appanage of the State and to re-establish ecclesiastical discipline were the great objects alike of Gregory and Hugh, and if, in certain cases, Gregory allowed his zeal to outstrip his discretion, he found in Hugh an unflinching ally, and to the Benedictine Order, particularly the Cluniac branch, belongs the chief credit of promulgating among the people and carrying into effect in Western Europe the many salutary reforms emanating from the Holy See. In founding Cluny in 910, and endowing it with his entire domains, William the Pious of Aquitaine had placed it under the direct protection of Rome. 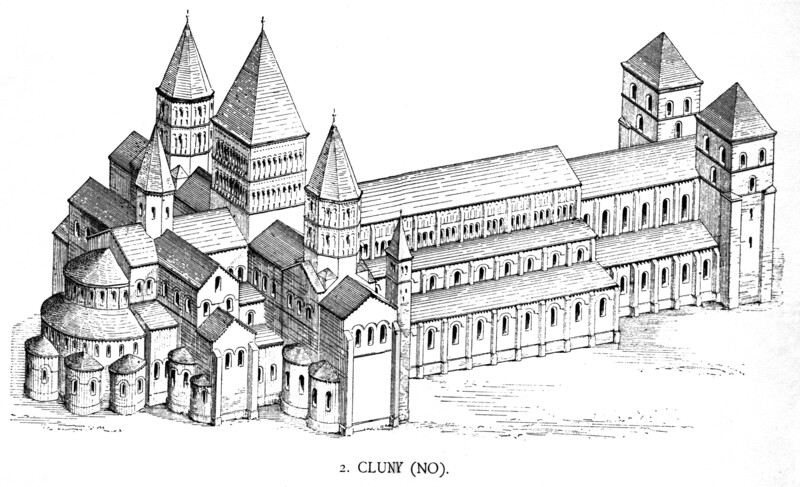 Thus Cluny, with its network of daughter-foundations (see Cluny, Congregation of; Gallia Christ., II, 374), was a formidable weapon for reform in the hands of the successive Popes. Hugh entrusted the election of the superiors of all cloisters and churches subject to him into spiritual hands, promised them — in addition to the privileges of the congregation — the support and protection of Cluny, and thus saved hundreds of cloisters from the cupidity of secular lords, who were very loath to interfere with the rights of a congregation so powerful and enjoying such high favor with emperors and kings. To secure this protection numbers of cloisters became affiliated with Cluny; new houses were opened in France, Germany, Spain, and Italy, while under Hugh was also founded at St. Pancras near Lewes the first Benedictine house in England. (See, however, St. Augustine of Canterbury; St. Dunstan.) Since the superiors of most of these homes were either directly or indirectly nominated by Hugh, and since, as abbot, he had to ratify the elections, it is easy to understand how important a role he played in the great struggle between imperialism and the Holy See. 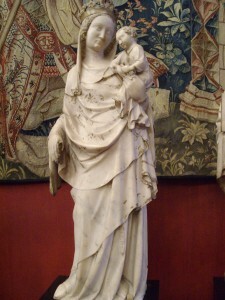 Simony was widespread and was one of the evils being addressed by the Church in the Investiture Question. In this woodcut, a king invests a bishop with the crozier and other insignia of his episcopal office, usurping the Pope's sole right to do this. As early as 1049, at the age of twenty-five, Hugh appeared at the Council of Reims. Here, at the request, and in the presence of Leo IX, he expressed so energetically against the reigning abuses that even the simoniacal bishops could not withstand his zeal. This advocacy contributed largely to the passing of many remedial ordinances concerning church discipline (cfr. 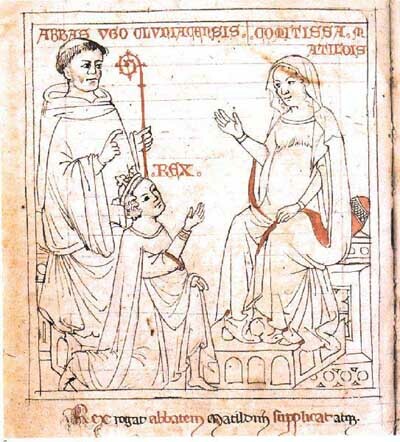 Labbe, “Conc.”, IX, 1045-6), and led Leo IX to take Hugh with him to Rome that he might have the assistance and advice of the young abbot at the great council to be held in 1050, at which the question of clerical discipline was to be decided and the heresy of Berengarius condemned (cfr. Hefele, “Conciliengesch.”, IV, 741). Leo’s successor, Victor II, also held Hugh in the highest esteem, and confirmed in 1055 all the privileges of Cluny. On Hildebrand’s arrival in France as papal legate (1054), he hastened first to Cluny to consult with Hugh and secure his assistance at the Council of Tours. Stephen IX, immediately on his elevation, summoned Hugh to Rome, made him the companion of his journeys, and finally died in his arms at Florence (1058). Hugh was also the companion of Nicholas II, and under him took part in the Council of Rome which promulgated the important decree concerning papal elections (Easter, 1059). He was then sent to France with Cardinal Stephan, a Monk of Monte Cassino, to effect the execution of the decrees of the Roman synod, and proceeded to Aquitaine, while his colleague repaired to the northwest. The active support of the numerous cloisters subject to Cluny enabled him to discharge his mission with the greatest success. He assembled councils at Avignon and Vienne, and managed to win the support of the bishops for many important reforms. In the same year (1059) he presided over the Synod of Toulouse. At the Council of Rome in 1063 he defended the privileges of Cluny which had been recklessly attacked in France. Alexander II sent St. Peter Damian, Cardinal Bishop of Ostia, as legate to France to adjudicate in this and other matters, meanwhile ratifying all the privileges held by Hugh’s predecessors. After a stay at Cluny, during which he conceived the high admiration and veneration for the monastery and its abbot reflected in his letters (cfr. 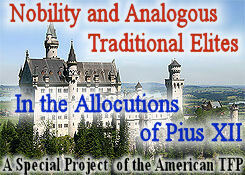 “Epist.”, VI, 2, 4, 5 in P.L., XCLIV, 378), the legate held a council at Châlons, which decided in favor of Hugh. 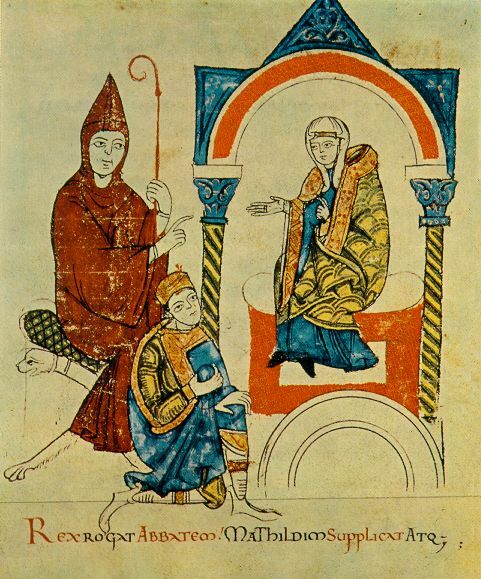 Scarcely had Hildebrand ascended the Chair of Peter as Gregory VII when he wrote to Cluny to secure Hugh’s cooperation in promoting his various reforms. 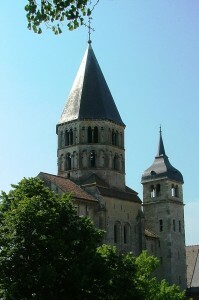 Hugh was entrusted to deal with the delicate case of the unworthy Archbishop Manasse of Reims, as well as with commissions in connection with the expedition of Count Evroul of Roucy against the Saracens in Spain. Frequently urged by Gregory to come to Rome, Hugh was unable to leave France until after the lamentable occurrences of 1076, but then hastened to visit the Pope at Canossa. With the assistance of Countess Mathilda, he managed to bring about the reconciliation — unfortunately of short duration — between Gregory and Henry IV, who had already addressed a letter full of affection declaring his great desire for the peace of the Church (cfr. “Hist. Lit. de la France”, loc. cit. infra). Hugh was subsequently engaged with the papal legate in Spain in the matter of ecclesiastical reform, and, as a result of his diligence and the high favor he enjoyed with Alphonsus VI of Castille, the Mozarabic was replaced by the Roman Ritual throughout that monarch’s realm. Thanks to the assistance of the many Cluniac foundations in Catalonia, Castille, Leon, Aragon, etc., and the many bishops chosen from their inmates, he was also enabled to give a great impetus to ecclesiastical reform in these countries. In 1077 he was commissioned to presides over the Council of Langres, and later to undertake the removal of the Bishop of Orleans and the Archbishop of Reims. Gregory wrote him many affectionate letters, and at the Roman synod in 1081 referred to Hugh in terms of praise seldom used by a successor of Peter concerning a living person. That this appreciation was not confined to the Holy Father is evident from the fact that, when asked by Gregory whether his opinion was shared by them, all present answered: “Placet, laudamus” (Bullar. Clun., p. 21). "On the revival of the quarrel between Henry IV and the Holy See, Hugh set out immediately for Rome"
On the revival of the quarrel between Henry IV and the Holy See, Hugh set out immediately for Rome, but was seized on the way and conducted before the monarch. So earnestly did he urge Henry to make his submission to Peter’s successor that he seemed again to have bridged the quarrel, if this were not another example of the king’s well-known duplicity. 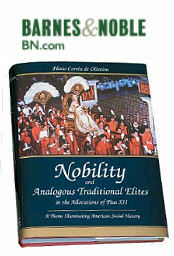 It is scarcely necessary to state that Hugo’s intimacy with the Holy See continued unchanged under Urban II and Paschal II, since both issued from the ranks of his monks. Surrounded by cardinals and bishops, Urban consecrated on 25 October, 1095, the high altar of the new church at Cluny, and granted the monastery new privileges, which were augmented by Paschal during his visit in 1107. At the great Council of Clermont in 1095, whose decision to organize the First Crusade was a clear indication of the great religious enthusiasm resulting from Gregory’s and Hugh’s labors, the abbot performed most valuable services in the composition and promulgation of the decrees, for which he was specially thanked by the Pope. Until the death, in 1106, of Henry IV, who in that year addressed two letters to his “:dearest father”, begging for his prayers and his intercession with the Holy See (cfr. 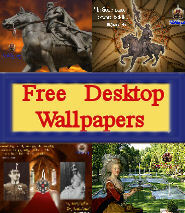 “Hist. Lit. de la France”, loc. cit. infra), Hugh never relaxed his efforts to bring about a reconciliation between the spiritual and temporal powers. In the spring of 1109, Hugh, worn out with years and labors, and feeling his end approaching, asked for the Last Sacraments, summoned around him his spiritual children, and, having given each the kiss of peace, dismissed them with the greeting: Benedicite. Then, asking to be conveyed to the Chapel of our Blessed Lady, he laid himself in sackcloth and ashes before her altar, and thus breathed forth his soul to his Creator on the evening of Easter Monday (28 April). His tomb in the church was soon the scene of miracles, and to it Pope Gelasius I made a pilgrimage in 1119, dying at Cluny on 20 January. 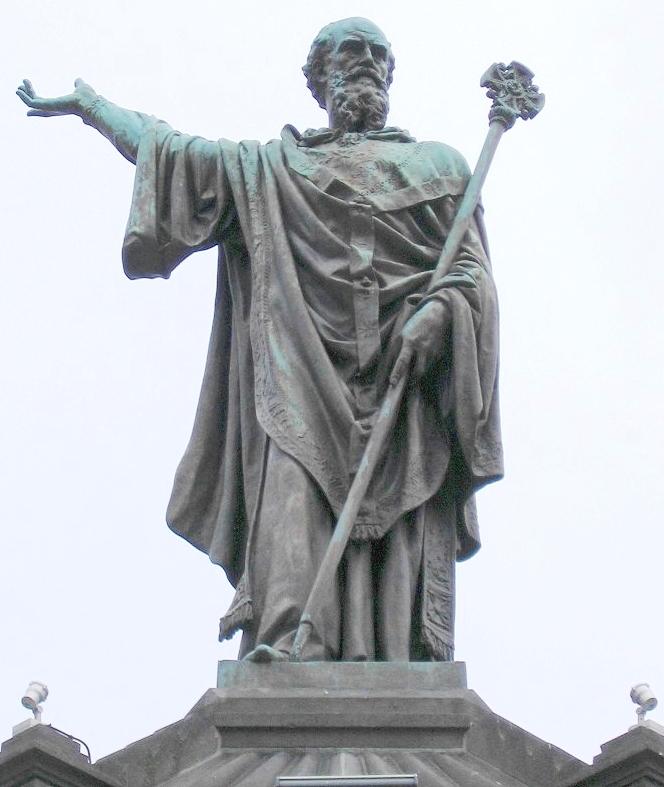 Elected at the monastery on 2 February, Callistus II began immediately the process of canonization, and, on 6 January, 1120, declared Hugh a saint, appointing 29 April his feast-day. In honor of St. Hugh the Abbot of Cluny was henceforth accorded the title and dignity of a cardinal. At the instance of Honorius III the translation of the saint’s remains took place on 23 May, 1220, but, during the uprising of the Huguenots (1575), the remains and the costly shrine disappeared with the exception of a few relics. In the case of comparatively few of our saints has the decision of their own and subsequent ages been so unanimous as in that of St. Hugh. Living in an age of misrepresentation and abuse, when the Church had to contend with far grater domestic and external inimical forces than those marshaled by the so-called Reformation, not a single voice was raised against his character — for we disregard the criticism of the French bishop, who in the heat of a quarrel pronounced hasty words afterwards to be recalled, and who was subsequently one of Hugh’s panegyrists. 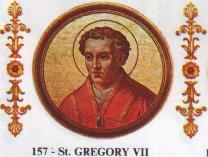 In one of his letters Gregory declares that he confidently expects the success of ecclesiastical reform in France through God’s mercy and the instrumentality of Hugh, “whom no imprecation, no applause or favors, no personal motives can divert from the path of rectitude” (Gregorii VII Registr., IV, 22). In the “Life of Bishop Arnulf of Soissons”, Arnulf says of Hugh: “Most pure in thought and deed, he as the promoter and perfect guardian of monastic discipline and the regular life, the unfailing support of the true religious and of men of probity, the vigorous champion and defender of the Holy Church” (Mabillon, op. cit. infra, saec. VI, pars II, P. 532). And of his closing years Bishop Bruno of Segni writes: “Now aged and burdened with years, reverenced by all and loved by all, he still governs that venerable monastery [sc. Cluny] with the same consummate wisdom — a man in all things most laudable, difficult of comparison, and of wonderful sanctity” (Muratori, “Rerum Ital. script.”, III, pt. ii, 347). 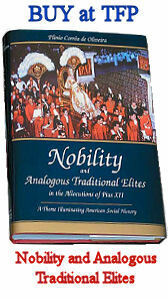 Emperors and kings vied with the sovereign pontiffs in bestowing on Hugh marks of their veneration and esteem. 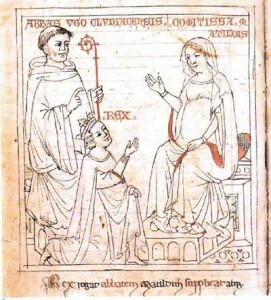 Henry the Black, in a letter which has come down to us, addresses Hugh as his “very dear father, worthy of every respect”, declares that he owes his own return to health and the happy birth of his child to the abbot’s prayers and urges him to come to the Court at Cologne the following Easter to stand sponsor for this son (the future Henry IV). During her widowhood Empress Agnes wrote to Hugh in terms no less respectful and affectionate, asking him to pray for the happy repose of her husband’s soul and for the prosperous reign of her son. Reference has been already made to the letters sent to Hugh by Henry IV, who, notwithstanding his prolonged struggle to make the Church subservient to the imperial power, seems never to have lost his affection and profound respect for his saintly godfather. In recognition of the benefits derived from the Cluniac foundations, Ferdinand the Great of Castille and Leon (d. 1065) made his kingdom tributary to Cluny; his sons Sancho and Alfonso VI doubled the tribute, and the latter, in addition to introducing the Roman Ritual at Hugh’s request, carried on a most affectionate correspondence with the abbot. In 1081 Hugh was chosen by the kings and princes of the various Christian kingdoms of Spain as arbiter to decide the question of succession. When Robert II of Burgundy refused to attend the Council of Autun (1065), at which his presence was necessary, Hugo was sent to summon the duke, and remonstrated with him so eloquently in the interests of peace that Robert accompanied the abbot unresistingly to the council, became reconciled with those who had put his son to death, and promised to respect thenceforth the property of the Church. 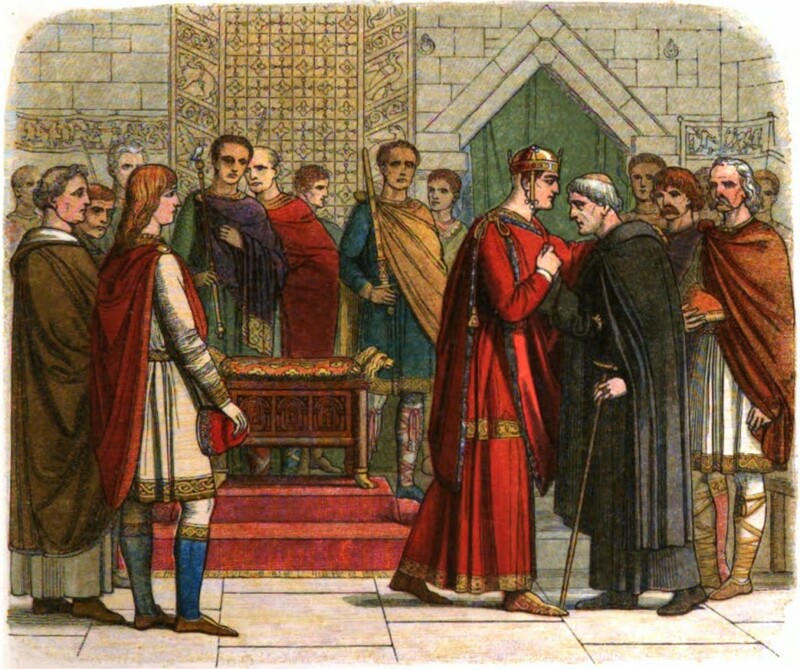 William the Conqueror of England, shortly after the Battle of Hastings (1066), made rich presents to Cluny and begged to be admitted a confrater of the abbey like the Spanish kings. He subsequently begged Hugh to send six monks to England to minister to the spiritual needs of the Court, and renewed his request in 1078, promising to appoint twelve of the Cluniac Congregation to bishoprics and abbacies within the kingdom. 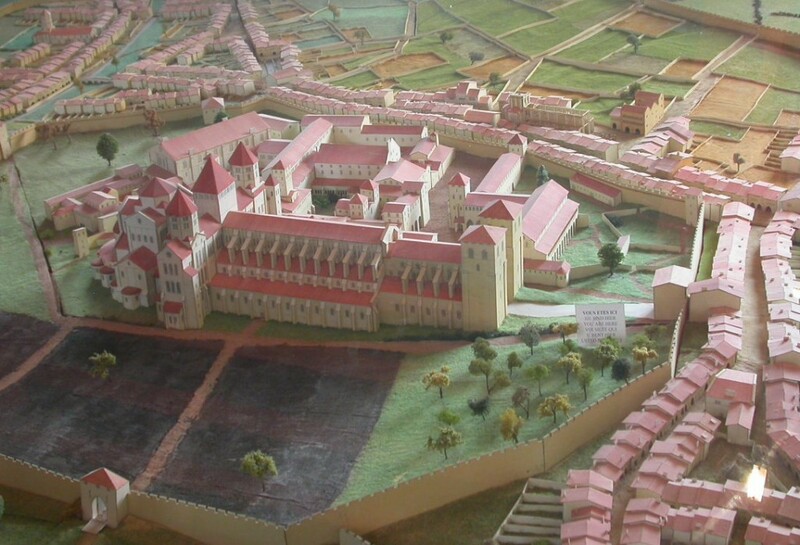 Hugh disabused his mind on the subject of ecclesiastical appointments, and, when founding a little later the Priorate of St. Pancras at Lewes, took every precaution to secure in the case of it and its dependent cloisters freedom of election and respect for canon law. How necessary this precaution was, the Investiture war, which broke out under William’s sons, clearly indicated. The champion of the Church in this struggle, St. Anselm of Canterbury, was one of the many bishops who consulted Hugh in their difficulties and trials, and on three occasions — once during his exile from England — visited the abbot at Cluny. For the monks under his care Hugh was a model of fatherly forethought, of devotion to discipline and prayer, and unhesitating obedience to the Holy See. In furtherance of the great objects of his order, the service of God and personal sanctification, he strove to impart the utmost possible splendor and solemnity to the liturgical services at Cluny. Some of his liturgical ordinances, such as the singing of the Veni Creator at Tierce on Pentecost Sunday (subsequently also within the octave), have since been extended to the entire Roman Church. He began the magnificent church at Cluny — now unfortunately entirely disappeared — which was, until the erection of St. Peter’s at Rome, the largest church in Christendom, and was esteemed the finest example of the Romanesque style in France. For the part played by Cluny in the evolution of this style and for its special school of sculpture, the reader must be referred to treatises on the history of architecture. Hugh gave the first impulse to the introduction of the strict cloister into the convents of nuns, prescribing it first for that of Marcigny, of which his sister became first prioress in 1061 (Cucherat, op. cit. infra), and where his mother also took the veil. Renowned for his charity towards the suffering poor, he built a hospital for lepers, where he himself performed the most menial duties. It is impossible to trace here the effect which his granting of personal and civic freedom to the bondsmen and colonists feudatory to Cluny, and the fostering of tradesmen’s guilds — the nuclei from which most of the modern cities of Europe sprang — have had on civilization. Although his favorite study was the Scriptures, St. Hugh encouraged science in every possible way, and showed his deep interest in education by teaching in person in the school attached to the monastery. Notwithstanding the exceeding activity of his life he found time to carry on an extensive correspondence. Almost all his letters and his “Life of the Blessed Virgin”, for whom as well as for the souls in purgatory he had a great devotion, have been lost. However, his extant letters and his “Sermo” in honor of the martyred Saint Marcellus are sufficient to show “how well he could write and with what skill he could speak to the heart” (Hist. Lit. de la France, IX, 479).